EASTON (August 25, 2015) – On Saturday, September 26, 2015 from 10:00am to 5:00pm, Jacobsburg Environmental Education Center, 400 Belfast Road, Nazareth, PA will host the inaugural Lehigh Valley Greenways Festival organized by Lehigh Valley Greenways Conservation Landscape partners. The Lehigh Valley Greenways Festival will be a family-friendly event with hands-on exhibits, education programs, trail information, gardening projects, and a full day of activities. Take a walk along Jacobsburg trails to learn about wildflowers or butterflies, birds, and dragonflies from naturalists. Get your hands wet learning about our waterways and what species call the streams their home. Chat with local colleges about their fascinating outdoor research and hear about environmental education opportunities from staff at Jacobsburg Environmental Education Center, Lehigh Gap Nature Center, and Wildlands Conservancy. Meet live animals at Wildlands Conservancy’s presentation. Learn which native plants you can add around your home to beautify the landscape while helping pollinators and other wildlife. 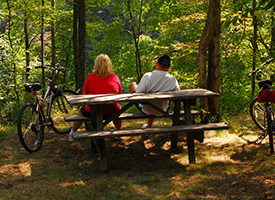 Keep active by discussing new trails being planned and developed throughout the Lehigh Valley. Borrow a fishing rod from Jacobsburg Environmental Education Center’s free loaner program and try your luck in the stream. 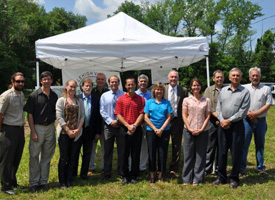 Pennsylvania Department of Conservation and Natural Resources (DCNR) initiated Lehigh Valley Greenways Conservation Landscape in 2004 to advance land conservation, outdoor recreation, trail connections, community revitalization and environmental education in the region. The Lehigh valley Greenways is a partnership consisting of over 20 public and private conservation organizations working together on projects enhancing the quality of life in your community.